Home & Office Window Cleaning Harold Wood RM3 | Quality Property Care Ltd. Enjoy much more than simply professional window cleansing, give Quality Property Care Ltd. a phone call and reserve the best window cleaning in Harold Wood RM3 at a good rate. Fully equipped and capable, we will leave no stains behind, taking away not only oil, but built up mud, grime, dirt, fine powder, mud, rain residue, fingerprints and a lot more. Secure rope access window cleaning, fully chemical- and danger free cleaning! The products and services delivered by Quality Property Care Ltd. are certified and approved by a number of institutions and agencies, and are suggested both as a domestic windows cleaning service and commercial window cleaning service. 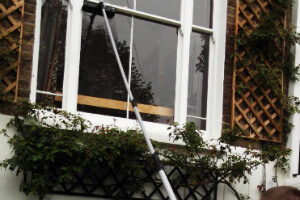 The windows on all kind of domestic properties and commercial properties can be cleaned, if they are accessible. For higher floors the company will provide a well-equipped and expert rope access window cleaning crew.You can get sticker removal as well. 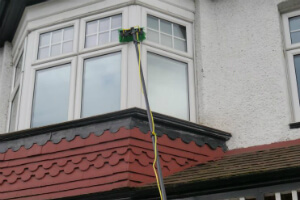 The only demand for the windows cleaning with the help of the water fed pole, is that there is an available parking area for the firm's van at a range of less than 30 meters from the windows. The reason is that the tank with purified water is in the van, and it is where the water is pumped out of. Along with your professional windows cleaning, you can also book one or more other maintenance services and outdoor cleaning. By booking more than one service provided by the company you will save a lot of money and time, and will get a full cleaning service at the same time. You can get professional gutter cleaning, patio or driveway jet washing, inside and outside conservatory window cleaning, gardening and others. However, for a full cleaning, you can order curtain cleaning and indoor windowns cleaning as well. Indoor cleaning is done by hand with squeegees, efficient and safe windows cleaning solution.So, you can get a perfect window and gutter cleaning, or only windows cleaning by booking the reliable and high-quality cleaning services of the company. Don`t waste time, but give us a call on 020 3746 4287! Get a 100% free estimate right now! See our budget-friendly price list and make a booking for safe and effective window cleaning in Harold Wood RM3 today!